Fernhill is the newest block of the month from Lynette Anderson. 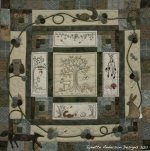 This whimsical wallhanging finishes at 28" square and features Lynette's fabric and buttons. This is a handwork lover's dream featuring embroidery and applique. Get started today! This Thursday, Aug. 22, through Saturday, Aug. 24, all books at the store will be on sale. The more you buy, the more you save! Let your inner bookworm shine this weekend!